Some of our most memorable travel experiences have been those where we’ve volunteered through the website workaway.info. Workaway has provided us with truly immersive cultural exchanges and has also allowed us to learn some new skills. On the workaway website you can search by country, city, or type of work to find volunteer opportunities that interest you. This can include anything from working on a farm, helping a family to learn English, taking care of animals, building eco-hotels; the opportunities are endless. When you find an experience you like, you click on the profile to view photos, read about the experience and requirements and read reviews from past workaway-ers. The workaway host provides free accommodation in exchange for a couple hours of work each day. It’s an affordable way to travel the world and an intimate way to learn about a new culture. You can volunteer for days, weeks, or months depending on the availability of the host. Though you begin the workaway as a volunteer you often leave feeling more like family. Through workaway we’ve had the privilege to be treated as a guests in locals homes. 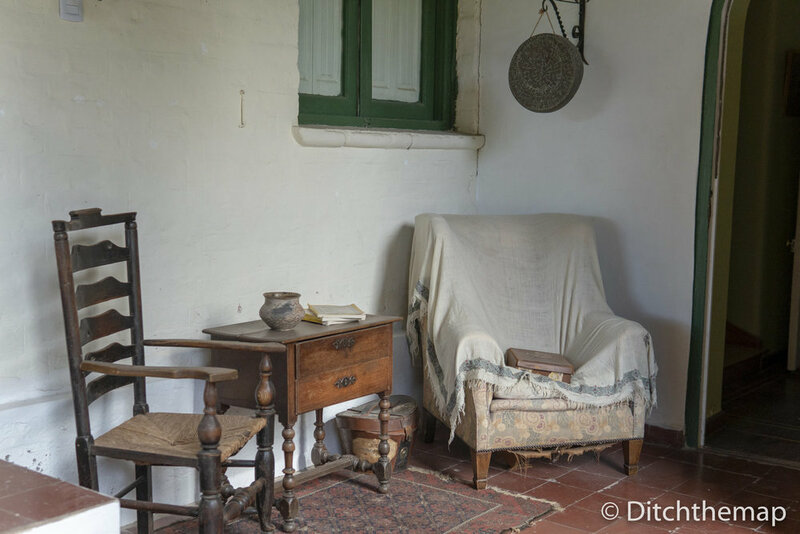 Our most recent workaway experience took us to the outskirts of San Rafael, a small town in Argentina. Driving out of the city center of San Rafael the buildings giveaway to dusty fincas (or farms). Some fincas are still functioning, but many are in varying levels of disrepair. This is due to the harsh climate; the land is difficulty to cultivate and care for because of the lack of water and dry conditions. Sadly, many fincas here remain desperately on the market for years at the expense of the owner’s pocket. Our host, the owner of the bed and breakfast, was an incredibly friendly British-Argentine gentleman. He embodied hospitality with his animated, witty personality and welcoming and generous nature. We felt comfortable right away as he chatted with us on the ride to the property. He showed us to our modest simple room, which met our needs. He had an easy-going outlook on the requirements of our stay and emphasized that the work was never too strenuous and that siesta was an every day occurrence. The grandparents of our host moved from Britain to San Rafael at the turn of the 20th century. They sought a more affordable lifestyle and a dry climate to help with the symptoms of asthma. They purchased an ambitious 80 hectares of farm land complete with a farm house built by a German architect. Our host was born and raised in Argentina and while fluent in Spanish, retained his English. After moving between continents our host ultimately ended up back in the country of his birth, settling in his grandparent’s old farm house with his brother. The duo kept us quite entertained with their sparring and sarcastic British humor. The 80 hectares proved too cumbersome for him to maintain and irrigate so the host choose to focus his energy on converting the aging palatial farm house into a bed and breakfast instead. 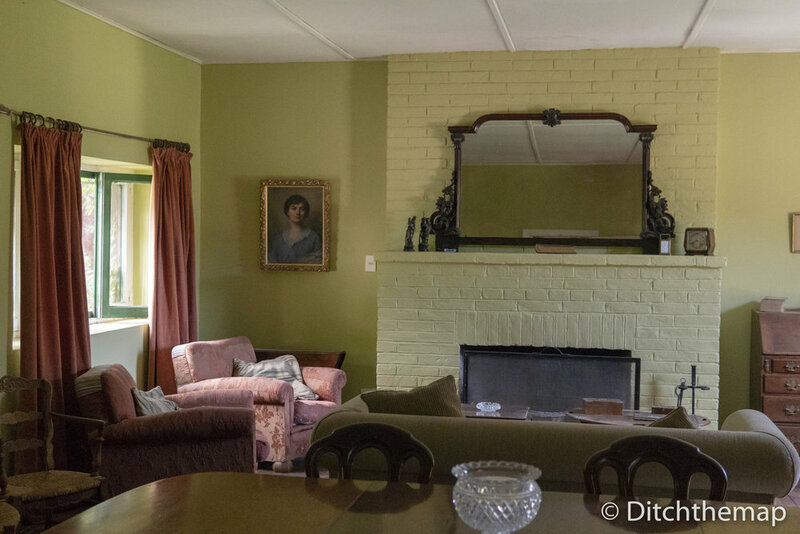 The home was rustic and tastefully cluttered with what we would call ‘vintage furniture’ and ‘antiques’ but are actual artifacts from his grandparents who at one time a lived a life of luxury in Argentina. The high ceilings with intricate paneling helped to regulate the temperature and kept the inside remarkably cool. Breezy hallways led to five grand guest bedrooms. Two horses and four friendly dogs roamed freely adding to the country feel of the property. We tried to wake up early each morning to walk the grounds before the hustle and bustle of the day. The four dogs excitedly accompanied us on our daily walks. We’d loop around the property and pass by the abandon plots of land and a plot of Malbec grapes, the only plot our host had been able to sell off. We were able to sample the grapes straight some the vines. Surprisingly the dogs sampled a few too. Apparently when the grapes are at their ripest the sweetness even attracts dogs. We found waking up early to be increasingly challenging because of the late nights and dinners, as is characteristic of Argentine culture. Each morning we’d stop by to see the horses and give them a pat or feed them composted scraps from the evening before. The pace of the day picked up as the guests began to wake up, so we’d set the tables and prepare breakfast in a frenetic scramble. 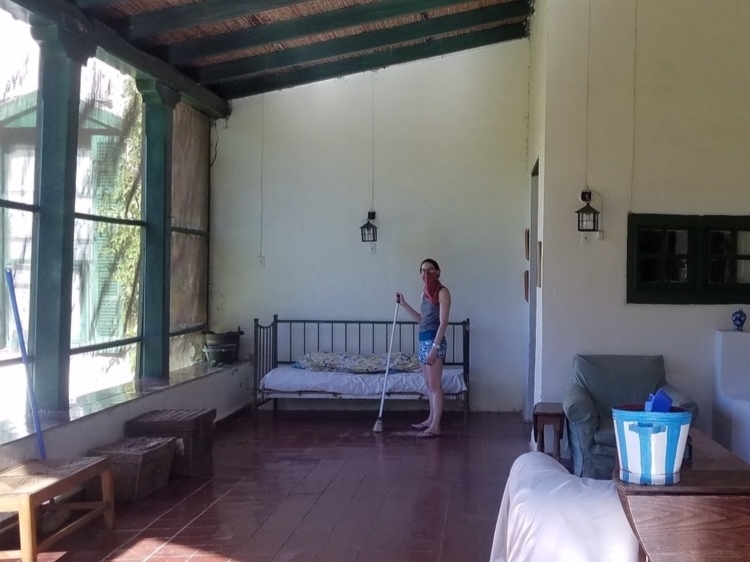 Throughout the day we’d do a mix of daily chores- help wash and hang laundry, wash dishes, clean and prepare rooms, maintain the pool, sweep the floors or mow the lawn. During the midday siesta we spent a few hours relaxing and found some nice shaded spots to practice yoga. In the evenings we started a fire in the fire pit to provide hot water for guests evening showers. Not only did we get to know our host, but we made friends with guests as well, most of whom were from Buenos Aires and seeking a reprieve from the big city. Our host made sure we were well fed and we were always invited to join for lunch and dinner. We took part in family style meals with guests and leisurely lunches, one particularly unhurriedly lunch not ending until 5pm. Meals were always a boisterous affair as the farmhouse table filled with guests- friends of the host, family members, guests at the bed and breakfast and neighbors. We were honored to be invited to an asado thrown by a couple of guests staying at the property. As is proper for any residence in Argentina, the yard was fitted with an outdoor covered patio with parilla (open grill) specifically for asado. Asado is more than a barbeque it’s an art form. The asador (person manning the grill) tends to the meat and restocks the smoldering coals with meticulous devotion. The food sets the pace for the evening as the meat is served in courses. The best cuts of meat are saved for last. While the meat is that star of the show, the social element is just as important. Everyone chats and snacks on picadas and wine while awaiting each course. The meat is cooked low and slow for hours and the asado carried on past 12pm. At the bed and breakfast, simplicity is valued over efficiency. People lingered over meals as meals were the “event” of the day. Meals were a time to unplug, converse and connect. Spending time conversing with the guests provided interesting insight into Argentine culture. From these conversations we learned that many Argentines still feel very connected to their European heritage. A portion of the population hold second passports and citizenships in Spain and Italy. The acquisition of the European passport is largely fueled by financial insecurity created by rampant inflation in Argentina. Inflation plagues the minds of and is a chronic stressor for most Argentinians. This has resulted in a “brain drain”as many educated in Argentina leave the country seeking financial security elsewhere. What’s interesting, however, is that despite major financial uncertainty, there is a lack of consumer debt. In the states we have a tendency to spend above our means, take out loans, and over use credit cards. But here people pay for their homes in cash and live by a mindset of only buying what they can afford. Of course, with an unreliable banking system and economy, interest is hard to determine because of the fluctuating value of the currency. We left the workaway with a deeper understanding and respect for Aregentine culture and an emotional connection to the country and its people.